So my last house update was in April and man has alot happened since then. If you follow along on Instagram, then you may have seen some of the stories that I posted of progress in the house. As you can see, the brick and stonework is almost complete on the house. There are still a few areas that have some stone work left, like on the back patio, but the front of the house is nearly complete. The inside of the house looks completely different than it did in my last post. Once the drywall was up the trim carpenters came in and got to work. They did an amazing job. I couldn’t be happier with the way things are turning out. 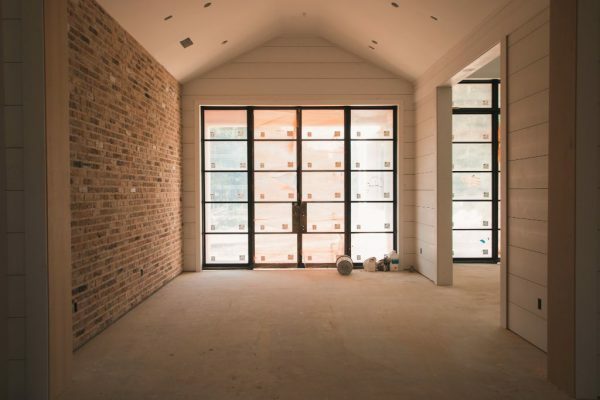 We have a lot of shiplap in the house, more than we remembered including in the original design plans over a year ago, and once they started making all the cuts and nailing it up, we couldn’t believe the difference it made. 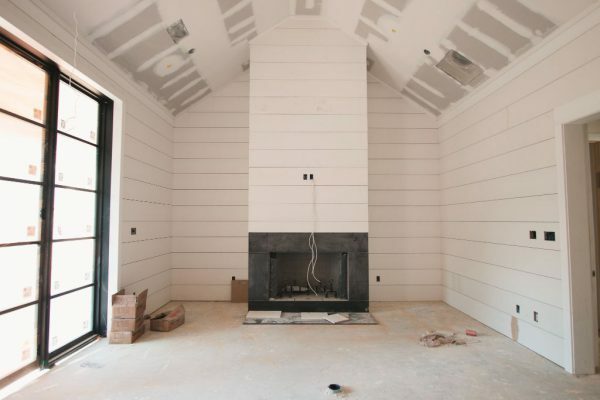 We asked ourselves several times, “Is it too much shiplap?” but I think we balaced it well with the other materials we chose to use. The one room that has changed the most is probably the kid’s school/game room. 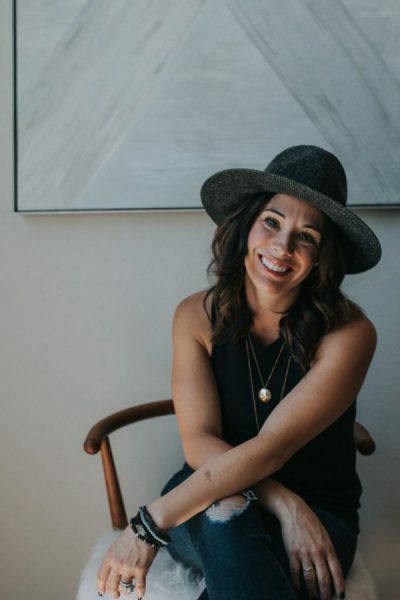 Shiplap from floor to ceiling and I am in love with it. 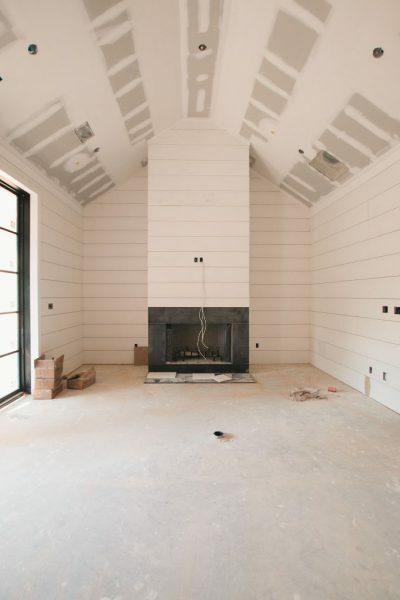 This is the one room that I didn’t hesitate going so heavy on the shiplap because the ceilings are so high. We had to do something dramatic but fun. This room is going to be used everyday and I want it to be one that is bright and inviting. I hope we accomplished that. I can’t wait to see it once the wallpaper goes up on the ceiling. 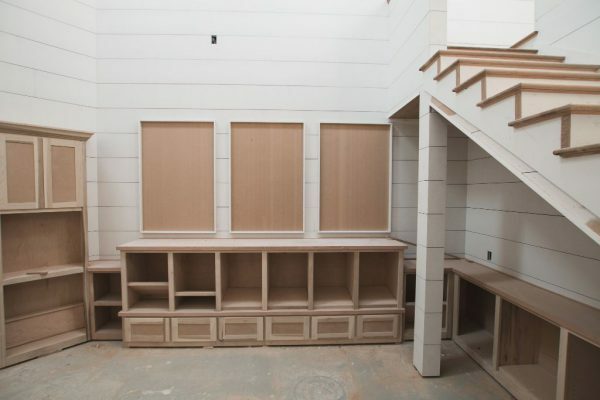 We wanted plenty of drawers and open shelving to store things. My hope is that everything will have it’s place but in reality, it is a kid’s room so things will be everywhere but maybe things can be more of an organized mess. I’m ready to curl up in that loft and read some good books with the kids. The kitchen has also changed. Cabinets and the reclaimed Chicago Brick are up and I can’t get enough. 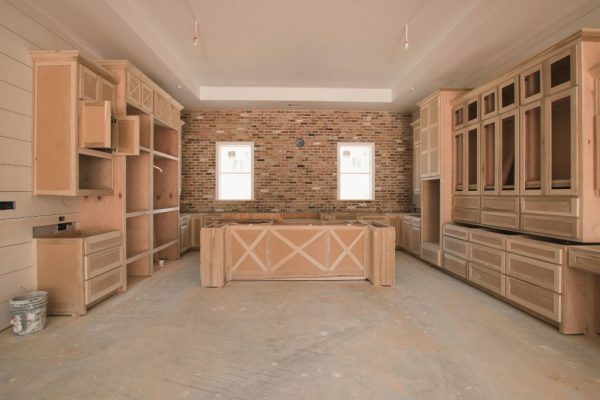 The brick wall is where the range and hood will be. This is a huge wall and it’s the focal point of this room. I wanted it to be timeless. I don’t want to get tired of it and then feel the need to change it in a few years. My fear was that if I used tile on such a big wall that it would look too busy. 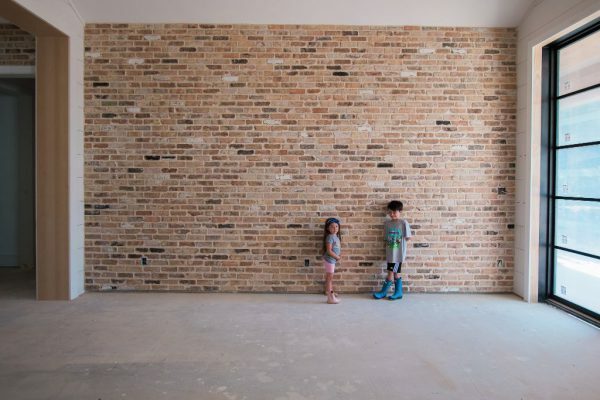 We wanted exposed brick in the house and when I threw out the idea to Graham to use it as the backsplash he was all for it. I think we made the right decision. 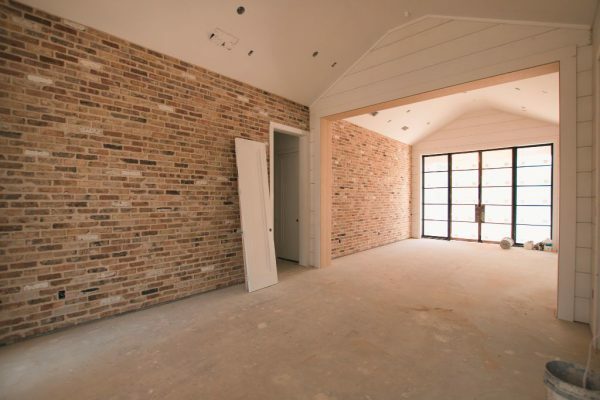 We decided to carry the exposed brick into the entry and dining room too. 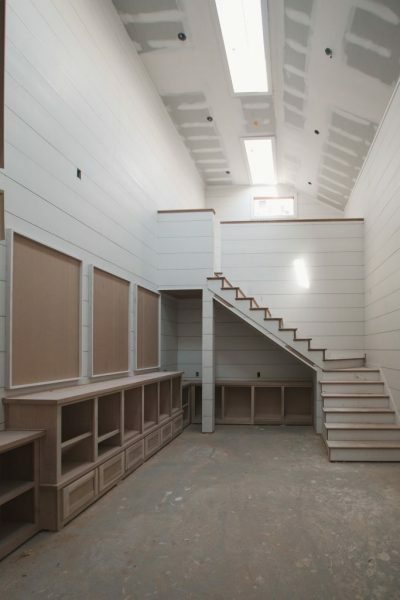 It runs along one wall and the other side has shiplap. Our bedroom has had a lot of progress made too. It’s all shiplap on 3 walls and the wall where the bed will be is brick. I knew what I wanted in here when we first started designing this house. 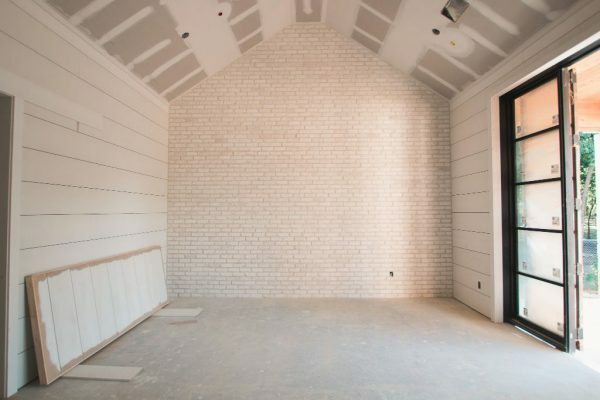 White shiplap, white ceiling, white brick, and something to make it a little masculine for Graham. We did that with the doors and the steel fireplace surround. This is Graham’s “man room”. 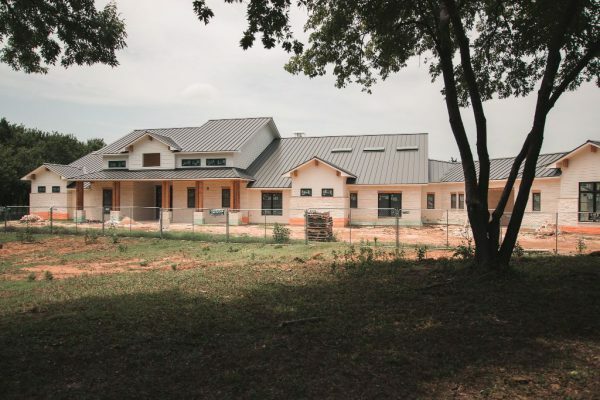 It’s where we will make all the men go during football season so the women can enjoy some wine and conversation without disturbing their commentary on the games. 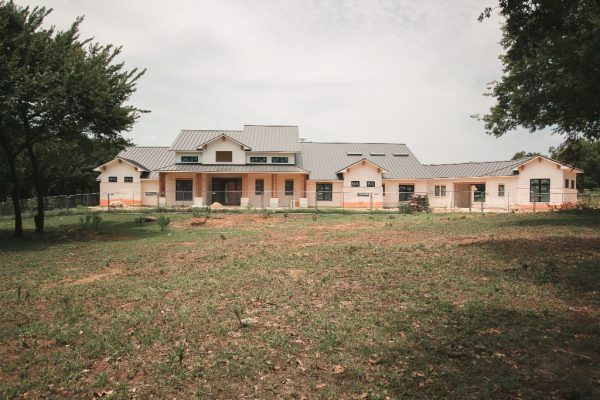 The guest house is looking great. I only took this picture of the outside but alot has been done on the inside which I’ll include in the next update. Most of the trimwork is complete. This took longer than I expected but I didn’t realize just how time consuming putting that much shiplap up would be. They did a great job. Next comes paint and they are prepping for that now. We had anticipated 6 weeks for this stage but it’s looking more like 8 weeks. They have to fill every little nail hole and sand everything down. 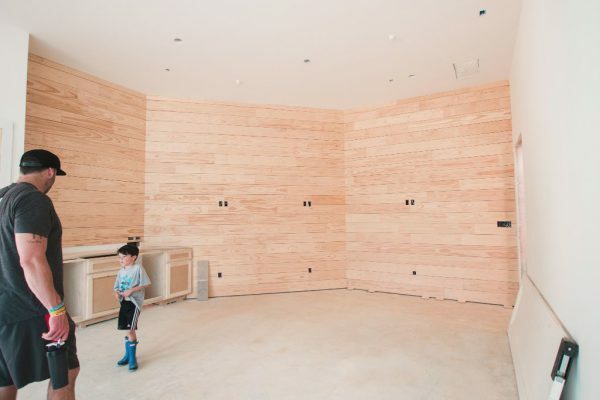 All that shiplap has A LOT of nail holes. This part is where it slows down again so my trips out there haven’t been as frequent. It’s working out well with our travel schedule too because all the slow times have lined up with our trips. 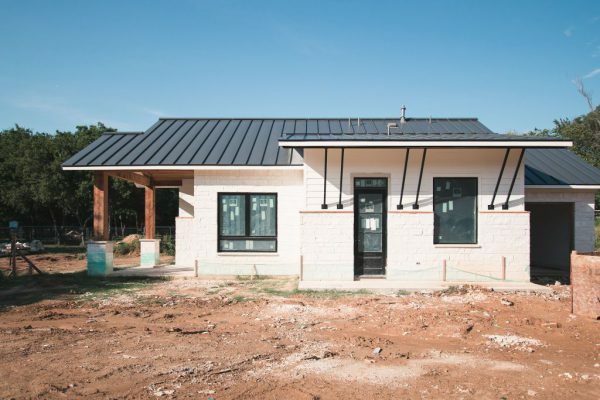 This house building journey has been fun and trying but seeing the progress of our dreams right before our eyes is pretty wonderful. I can’t stop feeling incredibly blessed and grateful everytime we are there. « Our Days in Portland.